Product prices and availability are accurate as of 2019-04-23 04:53:52 UTC and are subject to change. Any price and availability information displayed on http://www.amazon.com/ at the time of purchase will apply to the purchase of this product. Plays an important role in maintaining bones health and strength. Features MenaQ7 a natural, bioactive form of Vitamin K. Easy-to-swallow softgels. Vitamin K-2, also known as Menaquinone, supports normal blood clotting and activates enzymes responsible for bone formation. 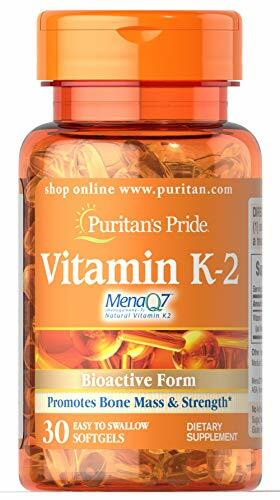 This K-2 supplement is a trademarked variety of Vitamin K called MenaQ7 a form of Vitamin K that is bioactive. Since Vitamin K-2 is important for bone health, but is not readily found in the diet, these easy-to-swallow softgels are a great way to get your daily value of this vital nutrient. No Artificial Flavor or Sweetener, No Preservatives, No Sugar, No Starch, No Milk, No Lactose, No Soy, No Gluten, No Wheat, No Yeast, No Fish, Sodium Free ** These statements have not been evaluated by the Food and Drug Administration. These products are not intended to diagnose, treat, cure or prevent any disease.